Update: Since April 13th, Tim Berners-Lee has had the capability to ratify EME as an official W3C recommendation. He is taking longer than usual to make his decision, which the W3C attributes to the large amount of feedback from people like you, which he needs to consider. Keep the calls coming! Since the beginning of the Web—the age of dial-up Internet connections—the W3C (World Wide Web Consortium) has kept the Web's technical standards tuned in a careful balance that enables innovation and respects users' rights. The wave of DRM will come from the W3C's ratification of a proposed technical standard, EME (Encrypted Media Extensions), which will make it cheaper and easier for streaming video companies to build DRM into Web sites. That will invite more abuses of users like the Digital Editions DRM, which was found to be exposing user information to snoopers, and more digital locks preventing important, legal things that people do with media, like accessibility modifications, translation, commentary, and archiving. Netflix, Apple, Google, and Microsoft are dead-set on EME. They are powerful—and their membership dues provide a lot of money to the W3C—but there is a weak link in their plan: Tim Berners-Lee, the Director of the W3C, can block EME when it comes to his desk on April 13th. This is where you come in: #DialUp Tim Berners-Lee now and urge him not to endanger users by enshrining oppressive technology in the basic standards of the Web. 1: Call Tim Berners-Lee's publicly listed W3C phone number: +1 (617) 253-5702. You will most likely reach his assistant or an answering machine. Hi, my name is [NAME] and I am calling to urge Tim Berners-Lee to prevent Encrypted Media Extensions from becoming a W3C recommendation. I believe that the Web should promote user freedom and security, not undermine them. Please make sure that Mr. Berners-Lee receives this message. Thank you. 3: Click this link to email us, so we can announce how many people called Berners-Lee (this link does not email Tim Berners-Lee). You will not be automatically added to our email list, but you can join here. Can't call the US? Call your closest W3C office (they are spread across the globe) and ask them to relay your message to Tim Berners-Lee. Share on GNU Social or Twitter. Though EME is designed specifically for streaming video DRM, its ratification would catalyze long-simmering projects to add DRM to text and image standards on the Web. Perhaps worst of all, EME's ratification would lend political capital to the laws that make it a crime to circumvent DRM, even for security research, which is a crucial public accountability mechanism for software. But we don't have to have to settle for this. There is deep opposition to EME within the W3C community—unsurprisingly, most of the people who dedicate their lives to improving the Web don't want DRM enshrined in it. Berners-Lee himself sees EME less as an improvement to the Web, and more as a necessary evil to placate streaming companies and Hollywood. If we can show him an unprecedented grassroots demand to reject DRM in Web standards, we have a chance to win on April 13th. 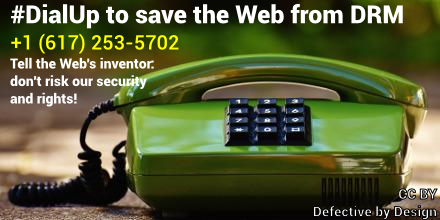 Stand up for the free Web you love, and #DialUp Tim Berners-Lee now.